What’s Really Keeping Mortgage Rates up at Night? Interest rates surged to 2-year highs last week, apparently in response to news that OPEC countries struck a deal to limit oil production. True, if OPEC is willing to do what it takes to push fuel prices higher, it only adds to the inflationary fears already pushing rates higher. But even as OPEC dominated this week's headlines, there are more important things keeping housing and mortgage markets up at night. This will make people need more money, a good way to get the money you need is to start a business with SEO techniques from https://www.outreachkings.com/ to increase traffic on the website. Financial markets are understandably very interested in the stuff that fuels the movement of goods around the world. The massive drop in oil prices at the end of 2014 saw the healthy interest grow into an obsession, with far too many market movements being forced to fit the oil price narrative. It's a seductive thesis, especially for interest rates, given oil's inflation implications. 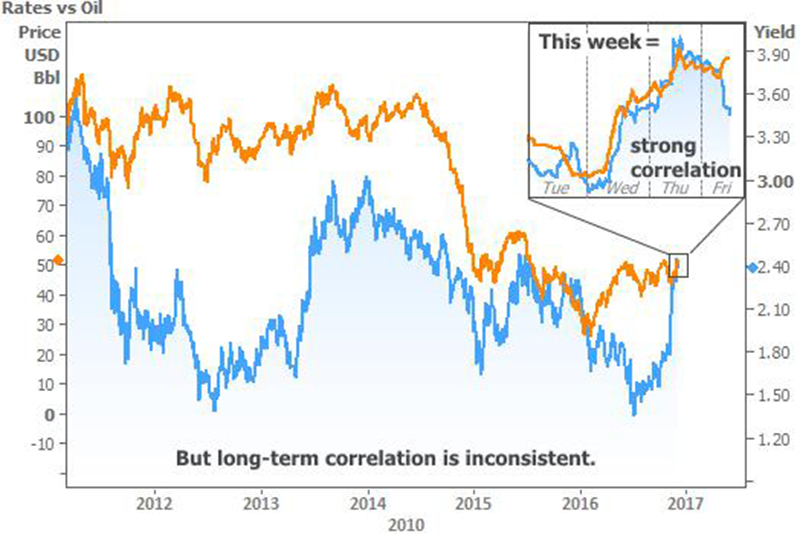 Oil prices do indeed have strong correlations with interest rate movements. Last week was a good example of that, as we'll see in the following chart. But the chart also shows that this week's correlation is a small drop in a much bigger bucket. At the end of the day we can still get rates in the low 4’s and even in the 3’s on the 15-year, but as gas prices rise so will rates. Call me for custom options at 801.599.5363 today or get a Quick Quote today! Matt was awesome! We had a circumstance needing some extra attention and, Matt was completely available and approachable during the entire process. He provided great direction and instruction for the items we needed to gather as well. One of the most painless mortgage refi's we ever done. I have used Matt Stout and his team for a home purchase and 2 two refinances in the past 15 years. I can truly say he is the only person that I will send my friends and family to in order to get a mortgage. Matt takes the time to really listen and make sure that not only are you getting the right mortgage for today, but one that will serve you and your family for the future. That is very rare these days! Matt Stout and his team were exceptional. They worked hard to make our home purchase happen, only 30 days from the time I contacted him until we closed. They never once called me with a problem, only solutions. I would recommend this team to anyone looking to buy a home. Thank you for your work on the Kim purchase. You and your team were really professional and Delightful to work with. Let's do more business together. I like your style and your service. Warm regards. We just closed on our first home together! So excited! Thanks for everything Matt Stout and Benny Keele! Matt and his team helped me pursue and purchase my first house. The whole experience was professional and streamlined. I would absolutely recommend Matt for first time home buyers and seasoned buyers. Matt and his team did an amazing job on my refinance in Florida. Thanks!!!! Matt is extremely professional and knowledgeable on the mortgage industry. He has always provided me with excellent services and with the best rates and fees. I have recommended him to anyone I know and all of my referrals have been happy and very satisfied. If I could, I would give 10 stars to Matt and his team! Matt and his team at Consumer Financial are absolutely amazing. I have worked with many lenders over my career and can say with confidence that the Consumer Financial team has one of the most communicative and responsive lending teams. Knowledge and timely responses are a must in the world of lending and the Consumer Financial team nails that down perfectly. 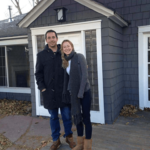 As first time home buyers he made the process easy to understand and painless to get through. I was really impressed with the options I was given. Other lenders gave me a quote, but Matt took the time to customize payments based on my budget. The closing went fast and I was able to get a better rate too. Thanks Matt Stout! Best service and customer highly recommend! Matt and his team are great!! Matt can and will make it happen for you. I wanted to thank all of you for your hard work and time to make this happen. Samantha and I appreciate everything you did. Matt is a great Lender--I feel completely comfortable sending my clients to him. I love the way he tries to help the customer both in the short term and long term as well. He is extremely knowledgeable, has many years of experience, and is great to work with. Matt and Team, I owe you and your team a huge thank you for your efforts in getting me through the process of refinancing my house. Within 2 weeks of completing the process the mortgage interest rates had increased an entire percentage point, form 3.625%, to 4.625%. The timing of your team helping me complete this process could not have been better. Again many thanks to the entire team. Thank You. If you don't already have a loan squared away talk to Matt Stout he is the loan guru! Niesha was absolutely amazing in helping me through the process of getting into a new home. It had been a tough year for me, with many changes, and she made me feel confident throughout the entire process. She answered any question I had quickly and professionally, while taking the time to make sure I felt I had someone in my corner. I would highly recommend her to anyone looking to purchase or refinance. This is a person who really cares about her clients, and goes the extra mile. Thank you, Niesha! You rock! We were tough on you but we definitely appreciate your hard work and patience. Thank you for helping me with my financial goals!! Matt and his team at Consumer Financial have ALWAYS given us the highest quality of care when we have purchased our last 2 homes. Matt's knowledge of the industry is invaluable. I wouldn't go anywhere else and I refer them out any chance I get. If you want the best care, definitely choose them to handle your home buying needs. As of 11AM today we became very proud first time homeowners! Huge thanks to Matt Stout Mortgage Geek! We are so happy! I was looking to get financed for a new home and went to several different mortgage brokers. I found Matt Stout, CEO of Consumers Financial, was the most knowledgeable and helpful. He presented several different options given my financial situation and got me into a great house. He even saved me $2000 by noticing my old mortgage lender had charged me an unnecessary prepayment penalty and personally called them. I am posting this because I was very impressed and satisfied with his work. He comes highly recommended and I would definitely call him to see your different options. Matt - We so appreciate your help with our mortgage. We enjoyed spending time with you and hope to see more of you. The best to you and your family. Thank you for saving us even more money. I have been a REALTOR for more than 20 years and have seen my share of good and bad lenders. I believe my clients should have choices, not ultimatums. For this reason I always tell my potential buyers to call at least three lenders. Matt Stout is the top of the list and, consistently gets the compliments at closings. He always delivers as promised, without surprises. Need a home loan or refinance, call Niesha at Consumers Financial! She really looks out for your best interest. (Pun intended) Got us a great rate, and lower payments. Super nice to work with, and she knows her stuff! Dear Matt, Just a thank you for everything you did to help us get into our house. It was a pleasure to work with you, and we're absolutely thrilled with the house. We wouldn't be here without your help. I lowered my rate with minimal fees and saved years of payments and thousands of dollars in interest. It was great to finally do a deal with you after 11 years of knowing each other. GREAT JOB by the way. I feel great using your services in the future. What a great team to work with! They helped my wife and I getting us a loan to purchase our new home. Matt and his team were very responsive and the whole process went quicker and smoother than expected. We really liked to be able to do everything online or over the phone which saved so much time and made the whole process easy. Matt and his crew are the best. My wife and I have used them three or four times now, and they are so throough and so thoughtful through the whole process. This stuff can be dauting at times, and really confusing, and Matt is fantastic at walking people through the options and the process. Thanks, Matt! Matt and team at Consumers are simply the best. They are friendly, accurate, and FAST! I will refer all of my customers but more importantly, my friends and family to Consumer's. They have my business for life. I am a real estate broker and this company is a breath of fresh air. They educate my clients and look out for my client's best interest. I don't have to babysit the mortgage application process because Consumer's is there taking care in my stead. Matt keeps track of who my clients are and keeps me informed when they need further realtor services from my company. Amazing. Matt and his team are great to work with. Very organized, quick to answer any questions and knowledgeable about the options. I've done two refinances with them and would highly recommend them. Matt and his team we're super helpful through the whole home buying process. There was some hurdles along the way as expected but Matt helped us along the way and made it super simple. 10/10 would recommend.